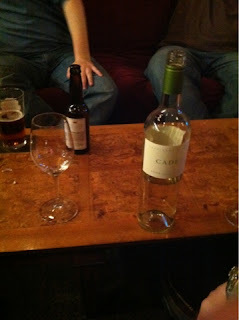 Last week my friend Alex invited me to his birthday party at Cedar Green Wine and Cheese. Located in an older strip mall, I didn't know what to expect. But what I found was part wine store, part bar, part deli, and part lounge. When you walk in, there's a bar on the left with five beers on tap. Surprisingly, there were quite a few people hanging out around the bar watching tv. To the right there were a few tables and a couple couches all in between display after display of wine. It's like a bar and a lounge happened to be plunked down right in the middle of a wine store. And although that sounds odd, it was actually awesome. I was able to pick a bottle off the shelf, hand it to the clerk, and then relax with my friends for about 15 minutes until my wine glasses and chilled wine arrived. If I'd been hungry, I could have also ordered food from any of the restaurants within the same shopping plaza and had it delivered. Swanky, it's not. But it is a great place to relax with some friends and enjoy a bottle of wine or a couple of beers. Do you have a favorite wine or beer shop in Cleveland where you can hang out and have a drink or two? I'd love to discover more places like Cedar Green Wine and Cheese.